OM-USB-5203 which requires an ac adaptor). All configurable options are software programmable, and the modules are fully software calibrated. The OM-USB-TEMP and OM-USB-5203 provide eight differential temperature input channels. The OM-USB-TEMP-AI provides eight analog input channels that are configured as four differential temperature inputs and four differential or single-ended voltage inputs. Temperature inputs are software programmable for different sensor types including type J, K, T, E, R, S, B, N thermocouples, 2, 3 or 4-wire Pt100 RTDs, 2, 3 or 4-wire thermistors and semi-conductor sensors and are configured in blocks of two channels. A different type of sensor (thermocouple, RTD, thermistor, semiconductor) can be connected to each block of two channels (both channels must be the same type). OM-USB-5203 have two integrated CJC sensors and the OM-USB-TEMP-AI has one CJC sensor. Voltage inputs (OM-USBTEMP-AI only) are software programmable for ±10V, ±5V, ±2.5V and ±1.25V ranges. Eight independent, TTL-compatible digital I/O channels are provided to monitor TTL-level inputs, communicate with external devices and to generate alarms. The digital I/O channels are software programmable for input or output. The OM-USB-5203 features eight independent temperature alarms. Each alarm controls an associated digital I/O channel as an alarm output. The input to each alarm is any one of the temperature input channels. The output of each alarm is software configurable as active high or low. The temperature threshold condition to activate each alarm is user programmable. When an alarm is activated, the associated digital I/O channel is driven to the output state. The OM-USB-5203 also has data logging capability. Measurements can be logged to a standard CompactFlash memory card (a 512 MB CompactFlash memory card is included with the OM-USB-5203). Data logging can only be done when the OM-USB-5203 is disconnected from the computer. External power is required for data logging via the included ac adaptor. User programmable settings in data logging mode include sampling interval and logging start mode (on power up, on button press or at a specified data and time). • Strip Chart—log and graph values acquire from analog inputs, digital inputs, temperature inputs and counter inputs. • Rate Generator—generate waveforms for counter outputs TracerDAQ PRO is an enhanced version of TracerDAQ. A comparison of some of the feature included in TracerDAQ vs TracerDQ PRO, see PDF. Configuration: Each DI/O bit can be independently configured for input or output. Power on reset is input mode. Pull-Up/Pull-Down Configuration: All pins pulled up to +5V via 47 kΩ resistors (default). Pull-down to ground (GND) also available. per second (typical), digital output; 100 port writes or single bit writes per second (typical). 참고: Comes complete with 2 m (6') USB cable and software and operator’s manual on CD. 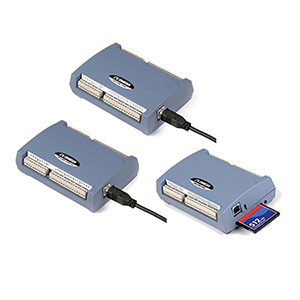 OM-USB-5203 also includes 100/240 Vac 50/60 Hz ac adaptor (USA plug) and 512 MB Compact Flash card.